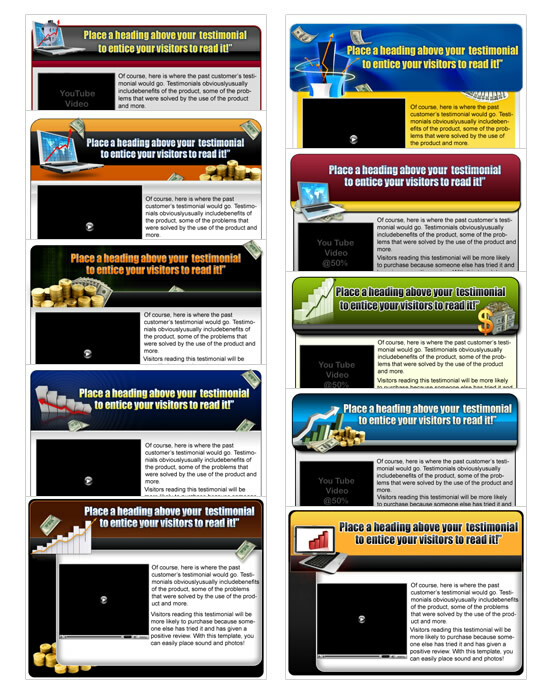 LightningIncome.com - Online eBusiness Opportunities for Web Entrepreneurs Turbo Power Graphics 2009 | Mini Site Graphics | Video Skins Templates! Right this very second, there could be a visitor on your website who is about to leave because your graphics are sloppy and unprofessional. 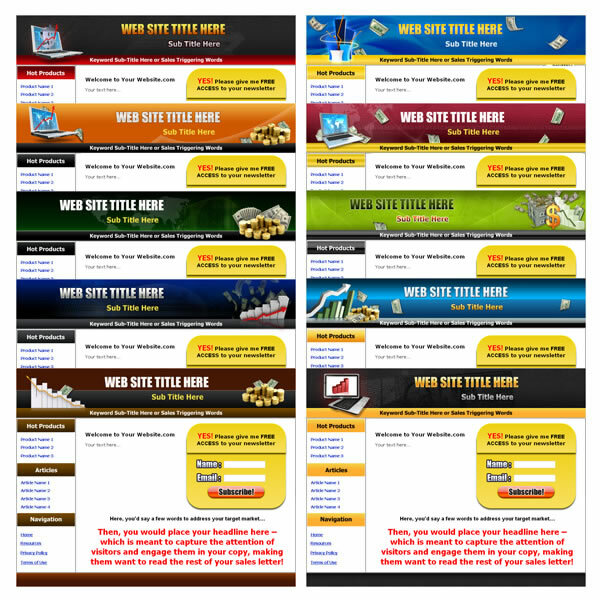 You could be LOSING MONEY all because of the graphics which rest on your website! That can all change today, though! With our amazing graphics package, your site will be sharp, attractive and professional – and you will never lose money because of your graphics again! Research has proven that website visitors are directly affected by the visual aspects of a website. Your website is the first impression visitors get of you, your services or your products. If that impression isn’t good – you ARE LOSING MONEY! Think about this – if you walked into a grocery store and it was filthy, with dust all over the place and hand-written signs everywhere – you would probably think twice before purchasing from that store. However, if you walked into a gleaming and bright store, with neat, professional signs and organized merchandise – you’d have no problem shopping there, right? The same goes with your website. You want the visitor to stay and become a customer. We’re going to ensure that you stop losing money today. Our graphics are top-notch, and we offer 10 different and unique graphics packages – all yours for one low price! Take a look at just what you receive. 10 Main Sales Pages – unique and beautiful in basic design. 10 Main Sales Pages with an Opt-In Header – allowing your visitors to quickly and easily leave their contact details while you build your subscriber list. 10 Thank You Pages – letting your customers know you appreciate their order. 10 One Time Offer or Special Offer Pages – so you can alert your customers to unique deals and savings or limited opportunities. 10 Testimonial Boxes in basic design – so your customers will know the level of quality you provide and the level of happiness previous customers have experienced. 10 Video Testimonial Boxes, beautifully designed and ready for your video testimonials. 10 Squeeze Pages in Basic Designs – all unique and beautiful. 10 Squeeze Pages Featuring Audio Capabilities, ready for your voice over features. 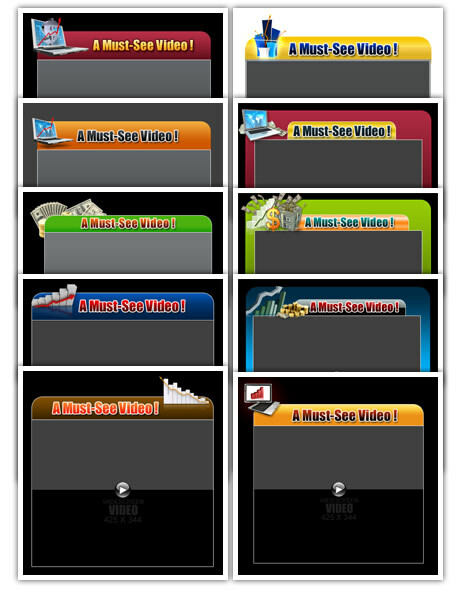 10 Squeeze Pages Featuring Video Capabilities so you can enter your introduction or other videos. 10 Review Pages, allowing you to post reviews of your product so your visitors know the value. 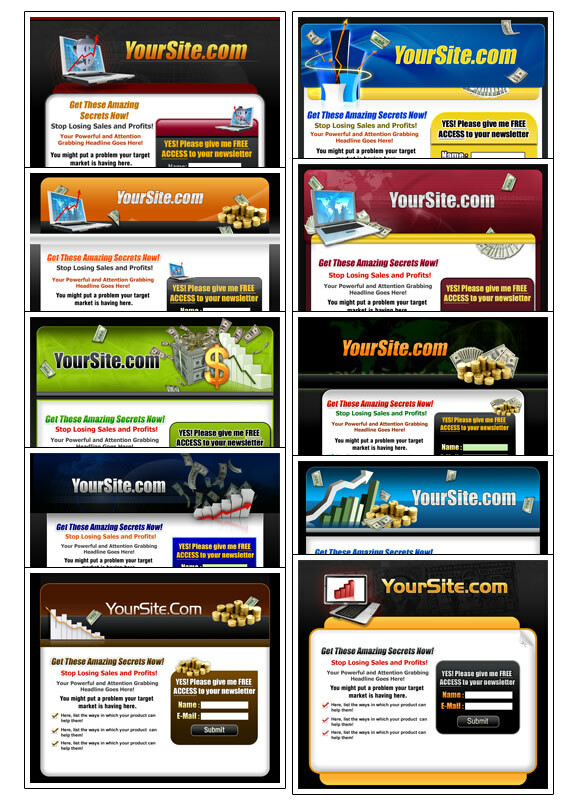 10 Adsense Ready Pages so you can paste your adsense codes with no problem at all. 10 Sets of Matching Trimmings – including bullets, checkmarks, ‘buy now’ buttons and the blank order buttons. WOW – That’s Over $1997 In Products, But Today – You Get Them For An Insane Blowout Price! Curious to See Our Beautiful Designs? No website is complete without the testimonials and our top-notch designers have cooked up some attractive and professional testimonial boxes for you – including video testimonial, text testimonial and audio and photo testimonial boxes. Your squeeze pages are oh-so-important for collecting contact information, building your subscriber list and prepping the visitor for the purchase. 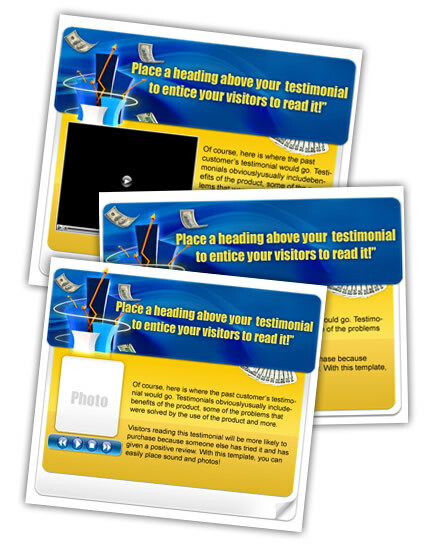 Our professional and beautiful squeeze pages will demand the attention of your visitors and captivate them – ensuring that you get that contact info. We also include video opt-in pages, allowing you to seamlessly insert your autoresponder code! On pages where you simply want to place a lone video, you can do so with the beautiful and professional video boxes below. 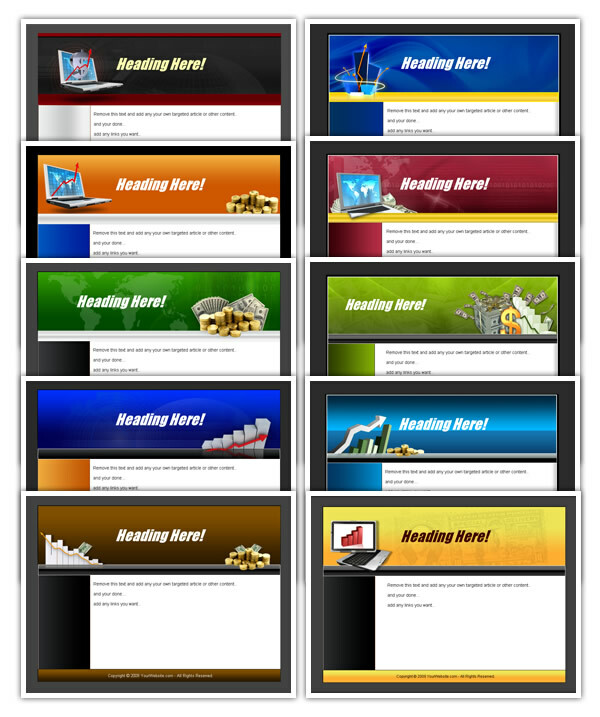 We’ve included gorgeous matching adsense ready and review page templates as well.. 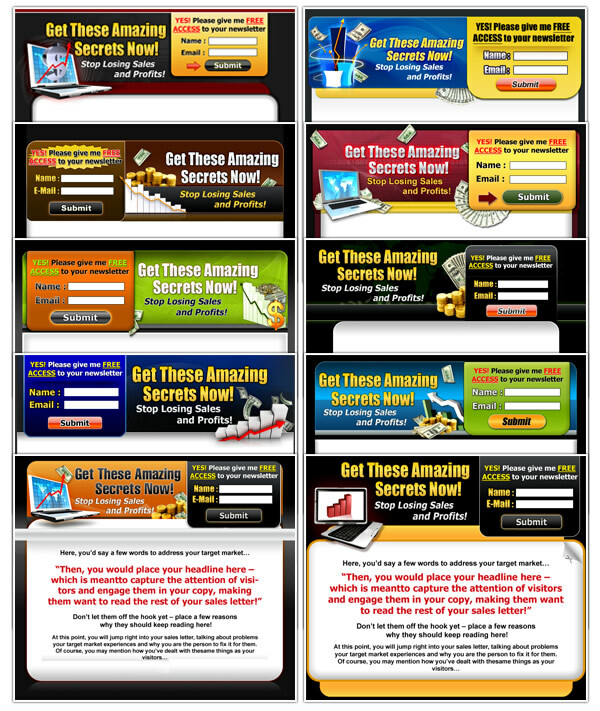 If you are among the next 30 people to Turbo Power graphics package, you will receive our exclusive bonus! be so irresistible for you, so we are offering it to you as a bonus for ordering now! Here’s a sneak view of how the video skins would look like! These graphics provide you with complete websites that are professional, beautiful and feature rich color and visual stimulation. These graphics are the difference between closing the sale and missing out on the sale. We’re offering something our competitors DO NOT OFFER – these packages are all completely different. They’re not just the same images with different colors – they are unique and each one is beautiful. They’re designed so that they can be used with any sort of online business and still create the success you want and deserve! If you don’t believe the graphics are that important – think again. All huge companies invest money in exceptional graphics for their marketing. It’s a fact that without these graphics, sales fall flat. For instance, visit any huge online retailer and check out the graphics on their website – they do not have crummy, unprofessional images. You can be sure that no expense was spared when they purchased their graphics – and you can get amazing, attractive graphics too. The difference – with our blowout graphics offer, you will not pay top dollar – in fact, you’re going to get this package – including all 10 unique designs for a ridiculously low price! Yes! I’m ready to receive my Turbo Power graphics package, complete with 10 unique graphic sets and everything I need to make a major-seller out of my website! I understand that I’ll be paying the ridiculously low price of $27 for this package ONLY ONE TIME and can use these graphics over and over again! Don’t ever miss out on sales again, simply because of your graphics! Use our graphics package to create a professionally designed, richly colored and beautiful website that will captivate your visitors and bring in the profits! P.S. Yes, it’s an extremely low price – so order now before we’re completely sold out of these sets. You will not find a better deal online for 10 unique and high-quality graphics sets! P.S.S. 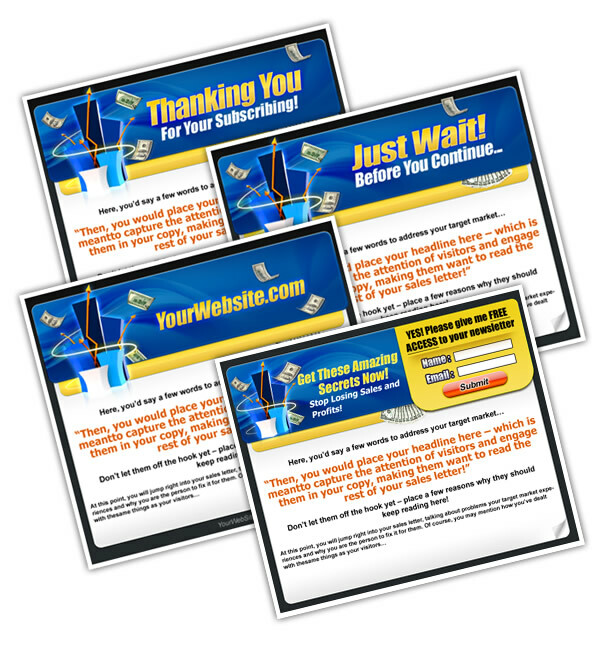 This limited graphic collection can turn your sales completely around! Get it now and experience the benefits of amazing, richly colored and beautiful graphics.